ntsysv: simple interface for configuring runlevels. A. It is a console based interactive utility that allows you to control what services run when entering a given run level. It configures the current run level by default. By using the --level option, you can configure other run levels. B. ntsysv returns 0 on success, 2 on error, and 1 if the user cancelled (or backed out of) the program. chkconfig: chkconfig provides a simple command-line tool for maintaining the /etc/rc[0-6].d directory hierarchy by relieving system administrators of the task of directly manipulating the numerous symbolic links in those directories. redhat-config-services: It is an X client.It will give the display of each of the services that are started and stopped at each run level. 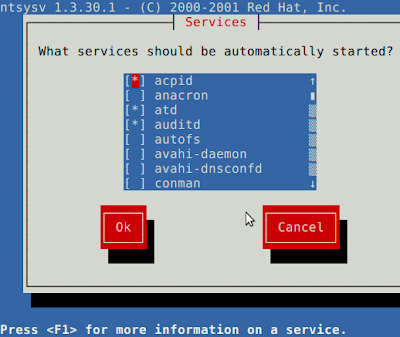 Services can be added, deleted, or re-ordered in the run levels 3 through 5 with this utility. service: It is used to start or stop a standalone service immediately. Most services accept the arguments start, stop, restart, reload, condrestart and status.